The menu at 2Love in Clapham Junction and some of the coffee making equipment in the window. There is a lot of coffee paraphernalia on display in the windows at 2Love Coffee House on St John’s Road near Clapham Junction. Reusable cups, filters, moka pots, Chemex’s etc. Stepping inside, a piano greets you while the counter is on the left. The wall behind the counter is lined with jars of different sorts of tea while the coffee menu is on a blackboard close to the window. Coffee is roasted by Monmouth and is also available to purchase for brewing at home. 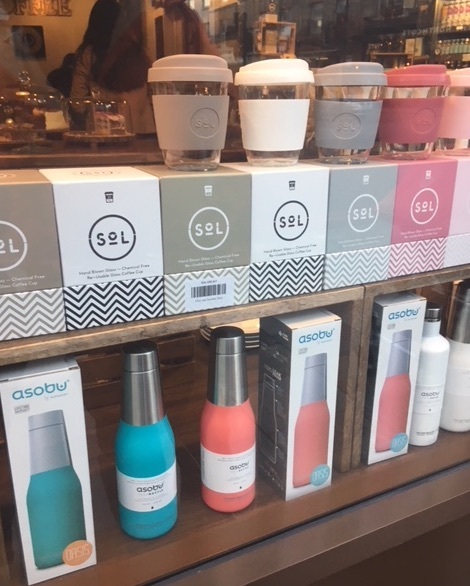 Moreover, the number of re-usable cups on display meant that I have to admit to a touch of reusable cup envy when I saw the variety of glass cups on sale, have I used my cup enough to justify a second*? 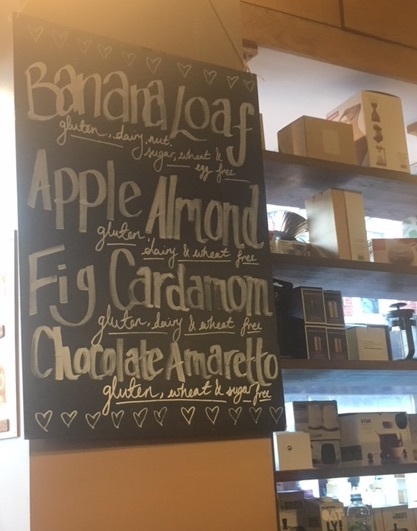 One great feature about this café was the care that they have taken to specify the allergens in their cakes on the blackboard, it is a considerate touch for people with allergies. Although we didn’t enjoy a cake on this occasion, it is great to know that I can! There is definitely a musical feel to the café, with statues of musicians on shelves around the shop and pictures of different singers on each of the walls. Although we managed to find a table, it was rather crowded with the amount of chatter and distractions in the café initially challenging my assumption that all cafés can offer a space to contemplate and consider connections. However, this brief doubt in the idea behind Bean Thinking did not last long. The change in direction started with our discussion over an Americano and a fruit juice: can there be a justification for not eating certain meats if you are not already vegetarian/vegan and if so, what is it? This didn’t seem to go down too well with the table adjacent to us. 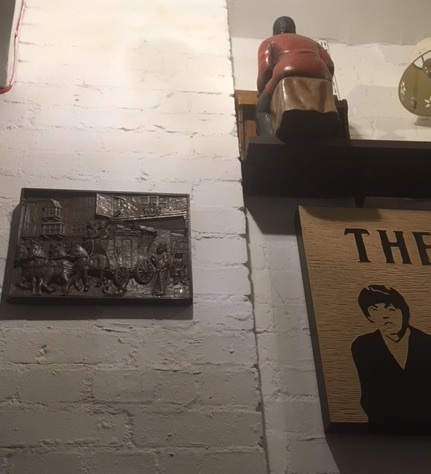 On the wall behind our table was a metal picture of a horse drawn cart where the figures had been raised out of the picture to form a 3D image. It was reminiscent of the patterns given for stone rubbing as a child. But it was also reminiscent of something else, something that shines a light on an area of manufacturing as well as, perhaps, our conversation about the ethics of meat eating. 3D Metal picture, musician statue and poster at 2Love Coffee House, who is the fairest of them all? You can see photos of such mirrors and their reflections here but how would such an image be produced? Apart from magic, the first explanations for the effect focussed on it being trickery on the part of the makers of these mirrors. Perhaps the image was patterned onto the front of the mirror using more dense (or less dense) material, covered with a thin layer of lead or tin and highly polished so that you would never notice it by looking at your reflection only by shining light at it? Maybe there was other trickery involved on the part of the mirror makers to deceive us into thinking we could see through the mirror to the back. Later researchers wondered if these mirrors really existed at all as few could be found when they searched for them amongst Japanese mirror workshops. And yet a few mirrors with this magic quality were found and subject to study in the late nineteenth century. How much is that cup in the window? Some of the reusable cups on sale at 2Love coffee house. The results showed that the image was not formed if projected too close to the mirror but only if the screen were held some distance away from the mirror’s surface. Moreover careful optical experiments showed that the image was formed by the surface of the mirror having thicker regions that were less convex than the rest of the mirror so that these reflected the light differently². Although the image at the back of the mirror had been cast and not stamped on the back, the stresses and strains formed by the pattern on the metal somehow propagated through the (thin) mirrors and produced distortions on the surface of the mirror. Even when highly polished, these minute distortions in curvature remained causing the reflection of the ‘magic’ image under certain lighting conditions. The theory describing the optics behind the magic mirrors was described as a ‘beautiful fact’ in a fairly recent mathematical description. But exactly how the stress of the pattern at the back gets transferred to the surface of the mirror remains to be understood³. Nonetheless, the fact that imperfections on one side of a material can be revealed by the projected reflections from the surface of the other, a process known as “Makyoh imaging”, is now used to check the integrity of semiconductor wafers before they are used in the manufacturing of devices. A piece of physics based neither on magic, nor on trickery, that is useful for our computer based lifestyles. When faced with something that seemed improbable, it is interesting that our first explanations were based on magic, deceit on the part of the one who made it or distrust of the phenomenon altogether. It was only by carefully studying something that was too easily dismissed that the beautiful physics and industrial relevance of the property was revealed. For me this has pertinence to the question of our own investigation into what we think about the world. Do we place too much weight in our judgement of what we do not understand merely based on our own experience of how things are? Do we need to look more carefully at what we thought we knew? Great pondering points for a visit to a café and confirmation that, provided you have good coffee and a nice chair to sit on, contemplation directions can be found no matter how popular the venue. *Although there are differences depending on what you take into account, lifecycle analysis done here, here and here suggest a break-even point of disposable to reusable cups from 15 to 100 re-uses. However, if you consider that part of the solution to our environmental problems involves breaking the consumerist mindset then perhaps, if it ain’t broke, no need to replace it.